World War I also had the effect of bringing political transformation to most of the principal parties involved in the conflict, transforming them into electoral democracies by bringing near-universal suffrage for the first time in history, as in Germany (1919 German federal election), Great Britain (1918 United Kingdom general election), and Turkey (1923 Turkish general election). After the Paris Peace Conference of 1919, the signing of the Treaty of Versailles on 28 June 1919, between Germany on the one side and France, Italy, Britain and other minor allied powers on the other, officially ended war between those countries. Other treaties ended the relationships of the United States and the other Central Powers. Included in the 440 articles of the Treaty of Versailles were the demands that Germany officially accept responsibility for starting the war and pay economic reparations. The treaty drastically limited the German military machine: German troops were reduced to 100,000 and the country was prevented from possessing major military armaments such as tanks, warships, armored vehicles and submarines. Historians continue to argue about the impact the 1918 flu pandemic had on the outcome of the war. It has been posited that the Central Powers may have been exposed to the viral wave before the Allies. The resulting casualties having greater effect, having been incurred during the war, as opposed to the allies who suffered the brunt of the pandemic after the Armistice. When the extent of the epidemic was realized, the respective censorship programs of the Allies and Central Powers limited the public's knowledge regarding the true extent of the disease. Because Spain was neutral, their media was free to report on the Flu, giving the impression that it began there. This misunderstanding led to contemporary reports naming it the "Spanish flu." Investigative work by a British team led by virologist John Oxford of St Bartholomew's Hospital and the Royal London Hospital, identified a major troop staging and hospital camp in Étaples, France as almost certainly being the center of the 1918 flu pandemic. A significant precursor virus was harbored in birds, and mutated to pigs that were kept near the front. The exact number of deaths is unknown but about 50 million people are estimated to have died from the influenza outbreak worldwide. In 2005, a study found that, "The 1918 virus strain developed in birds and was similar to the 'bird flu' that in the 21st century spurred fears of another worldwide pandemic, yet proved to be a normal treatable virus that did not produce a heavy impact on the world's health." The dissolution of the German, Russian, Austro-Hungarian and Ottoman empires created a number of new countries in eastern Europe and the Middle East. Some of them, such as Czechoslovakia and Poland, had substantial ethnic minorities who were sometimes not fully satisfied with the new boundaries that cut them off from fellow ethnics. For example, Czechoslovakia had Germans, Poles, Ruthenians and Ukrainians, Slovaks and Hungarians. The League of Nations sponsored various Minority Treaties in an attempt to deal with the problem, but with the decline of the League in the 1930s, these treaties became increasingly unenforceable. One consequence of the massive redrawing of borders and the political changes in the aftermath of the war was the large number of European refugees. These and the refugees of the Russian Civil War led to the creation of the Nansen passport. German and Austrian forces in 1918 defeated the Russian armies, and the new communist government in Moscow signed the Treaty of Brest-Litovsk in March 1918. In that treaty, Russia renounced all claims to Estonia, Finland, Latvia, Lithuania, Ukraine, and the territory of Congress Poland, and it was left to Germany and Austria-Hungary "to determine the future status of these territories in agreement with their population." Later on, Vladimir Lenin's government also renounced the Partition of Poland treaty, making it possible for Poland to claim its 1772 borders. However, the Treaty of Brest-Litovsk was rendered obsolete when Germany was defeated later in 1918, leaving the status of much of eastern Europe in an uncertain position. A far-left and often explicitly Communist revolutionary wave occurred in several European countries in 1917–1920, notably in Germany and Hungary. The single most important event precipitated by the privations of World War I was the Russian Revolution of 1917. On 28 June 1919 the Weimar Republic was forced, under threat of continued Allied advance, to sign the Treaty of Versailles. Germany viewed the one-sided treaty as a humiliation and as blaming it for the entire war. While the intent of the treaty was to assign guilt to Germany to justify financial reparations, the notion of blame took root as a political issue in German society and was never accepted by nationalists, although it was argued by some, such as German historian Fritz Fischer. The German government disseminated propaganda to further promote this idea, and funded the Centre for the Study of the Causes of the War to this end. 132 billion gold marks ($31.5 billion, 6.6 billion pounds) were demanded from Germany in reparations, of which only 50 billion had to be paid. In order to finance the purchases of foreign currency required to pay off the reparations, the new German republic printed tremendous amounts of money – to disastrous effect. Hyperinflation plagued Germany between 1921 and 1923. In this period the worth of fiat Papiermarks with respect to the earlier commodity Goldmarks was reduced to one trillionth (one million millionth) of its value. In December 1922 the Reparations Commission declared Germany in default, and on 11 January 1923 French and Belgian troops occupied the Ruhr until 1925. The treaty required Germany to permanently reduce the size of its army to 100,000 men, and destroy their tanks, air force, and U-boat fleet (her capital ships, moored at Scapa Flow, were scuttled by their crews to prevent them from falling into Allied hands). Germany saw relatively small amounts of territory transferred to Denmark, Czechoslovakia, and Belgium, a larger amount to France (including the temporary French occupation of the Rhineland) and the greatest portion as part of a reestablished Poland. Germany's overseas colonies were divided between a number of Allied countries, most notably the United Kingdom in Africa, but it was the loss of the territory that composed the newly independent Polish state, including the German city of Danzig and the separation of East Prussia from the rest of Germany, that caused the greatest outrage. Nazi propaganda would feed on a general German view that the treaty was unfair – many Germans never accepted the treaty as legitimate, and lent their political support to Adolf Hitler. The Soviet Union benefited from Germany's loss, as one of the first terms of the armistice was the abrogation of the Treaty of Brest-Litovsk. At the time of the armistice Russia was in the grips of a civil war which left more than seven million people dead and large areas of the country devastated. The nation as a whole suffered socially and economically. As to her border territories, Lithuania, Latvia and Estonia gained independence. They were occupied again by the Soviet Union in 1940. Finland gained a lasting independence, though she repeatedly had to fight the Soviet Union for her borders. Armenia, Georgia, and Azerbaijan were established as independent states in the Caucasus region. These countries were proclaimed as Soviet Republics in 1922 and over time were absorbed into the Soviet Union. During the war, however, Turkey captured the Armenian territory around Artvin, Kars, and Igdir, and these territorial losses became permanent. Romania gained Bessarabia from Russia. The Russian concession in Tianjin was occupied by the Chinese in 1920; in 1924 the Soviet Union renounced its claims to the district. 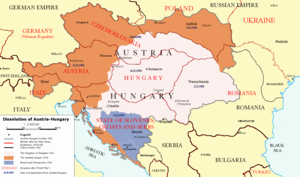 Borders of newly independent Hungary did not include two-thirds of the lands of the former Kingdom of Hungary, including areas where the ethnic Magyars were in a majority. The new republic of Austria maintained control over most of the predominantly German-controlled areas, but lost various other German majority lands in what was the Austrian Empire. Bosnia and Herzegovina, Croatia-Slavonia, Dalmatia, Slovenia, Syrmia Banat, Bačka and Baranja were joined with Serbia to form the Kingdom of the Serbs, Croats and Slovenes, later Yugoslavia. The occupation of Smyrna by Greece on 18 May 1919 triggered a nationalist movement to rescind the terms of the treaty. Turkish revolutionaries led by Mustafa Kemal Atatürk, a successful Ottoman commander, rejected the terms enforced at Sèvres and under the guise of General Inspector of the Ottoman Army, left Istanbul for Samsun to organize the remaining Ottoman forces to resist the terms of the treaty. On the eastern front, the Turkish–Armenian War and signing of the Treaty of Kars with the Russian S.F.S.R. took over territory lost to Armenia and post-Imperial Russia. On the western front, the growing strength of the Turkish nationalist forces led Greece, with the backing of Britain, to invade deep into Anatolia in an attempt to deal a blow to the revolutionaries. At the Battle of Dumlupınar, the Greek army was defeated and forced into retreat, leading to the burning of Smyrna and the withdrawal of Greece from Asia Minor. With the nationalists empowered, the army marched on to reclaim Istanbul, resulting in the Chanak Crisis in which the British Prime Minister, David Lloyd George, was forced to resign. After Turkish resistance gained control over Anatolia and Istanbul, the Sèvres treaty was superseded by the Treaty of Lausanne (1923) which formally ended all hostilities and led to the creation of the modern Turkish Republic. As a result, Turkey became the only power of World War I to overturn the terms of its defeat, and negotiate with the Allies as an equal. Lausanne Treaty formally acknowledged the new League of Nations mandates in the Middle East, the cession of their territories on the Arabian Peninsula, and British sovereignty over Cyprus. The League of Nations granted Class A mandates for the French Mandate of Syria and Lebanon and British Mandate of Mesopotamia and Palestine, the latter comprising two autonomous regions: Mandate Palestine and the Emirate of Transjordan. Parts of the Ottoman Empire on the Arabian Peninsula became part of what is today Saudi Arabia and Yemen. The dissolution of the Ottoman Empire became a pivotal milestone in the creation of the modern Middle East, the result of which bore witness to the creation of new conflicts and hostilities in the region. In Britain, funding the war had a severe economic cost. From being the world's largest overseas investor, it became one of its biggest debtors with interest payments forming around 40% of all government spending. Inflation more than doubled between 1914 and its peak in 1920, while the value of the Pound Sterling (consumer expenditure) fell by 61.2%. Reparations in the form of free German coal depressed local industry, precipitating the 1926 General Strike. Less concrete changes include the growing assertiveness of Commonwealth nations. Battles such as Gallipoli for Australia and New Zealand, and Vimy Ridge for Canada led to increased national pride and a greater reluctance to remain subordinate to Britain, leading to the growth of diplomatic autonomy in the 1920s. These battles were often decorated in propaganda in these nations as symbolic of their power during the war. Colonies such as the British Raj (India) and Nigeria also became increasingly assertive because of their participation in the war. The populations in these countries became increasingly aware of their own power and Britain's fragility. In Ireland, the delay in finding a resolution to the home rule issue, partly caused by the war, as well as the 1916 Easter Rising and a failed attempt to introduce conscription in Ireland, increased support for separatist radicals. This led indirectly to the outbreak of the Irish War of Independence in 1919. The creation of the Irish Free State that followed this conflict in effect represented a territorial loss for Britain that was all but equal to the loss sustained by Germany, (and furthermore, compared to Germany, a much greater loss in terms of its ratio to the country's prewar territory). Despite this, the Irish Free State remained a dominion within the British Empire. Alsace-Lorraine returned to France, the region which had been ceded to Prussia in 1871 after the Franco-Prussian War. At the 1919 Peace Conference, Prime Minister Georges Clemenceau's aim was to ensure that Germany would not seek revenge in the following years. To this purpose, the chief commander of the Allied forces, Marshal Ferdinand Foch, had demanded that for the future protection of France the Rhine river should now form the border between France and Germany. Based on history, he was convinced that Germany would again become a threat, and, on hearing the terms of the Treaty of Versailles that had left Germany substantially intact, he observed that "This is not Peace. It is an Armistice for twenty years." The destruction brought upon French territory was to be indemnified by the reparations negotiated at Versailles. This financial imperative dominated France's foreign policy throughout the 1920s, leading to the 1923 Occupation of the Ruhr in order to force Germany to pay. However, Germany was unable to pay, and obtained support from the United States. Thus, the Dawes Plan was negotiated after Prime Minister Raymond Poincaré's occupation of the Ruhr, and then the Young Plan in 1929. Nevertheless, by the end of the war the Allies realized they had made contradictory agreements with other Nations, especially regarding Central Europe and the Middle-East. In the meetings of the "Big Four", in which Orlando's powers of diplomacy were inhibited by his lack of English, the Great powers were only willing to offer Trentino to the Brenner, the Dalmatian port of Zara, the island of Lagosta and a couple of small German colonies. All other territories were promised to other nations and the great powers were worried about Italy's imperial ambitions; Wilson, in particular, was a staunch supporter of Yugoslav rights on Dalmatia against Italy and despite the Treaty of London which he did not recognize. As a result of this, Orlando left the conference in a rage. This simply favored Britain and France, which divided among themselves the former Ottoman and German territories in Africa. In Italy, the discontent was relevant: Irredentism (see: irredentismo) claimed Fiume and Dalmatia as Italian lands; many felt the Country had taken part in a meaningless war without getting any serious benefits. This idea of a "mutilated victory" (vittoria mutilata) was the reason which led to the Impresa di Fiume ("Fiume Exploit"). On September 12, 1919, the nationalist poet Gabriele d'Annunzio led around 2,600 troops from the Royal Italian Army (the Granatieri di Sardegna), nationalists and irredentists, into a seizure of the city, forcing the withdrawal of the inter-Allied (American, British and French) occupying forces. The "mutilated victory" (vittoria mutilata) became an important part of Italian Fascism propaganda. At the Paris Peace Conference in 1919, Japan was granted all of Germany's pre-war rights in Shandong province in China (despite China also being one of the Allies during the war): outright possession of the territory of Jiaozhou Bay, and favorable commercial rights throughout the rest of the province, as well as a Mandate over the German Pacific island possessions that the Japanese navy had taken. Also, Japan was granted a permanent seat on the Council of the League of Nations. Nevertheless, the Western powers refused Japan's request for the inclusion of a "racial equality" clause as part of the Treaty of Versailles. Shandong reverted to Chinese control in 1922 after mediation by the United States during the Washington Naval Conference. Weihai followed in 1930. A map with the post-war borders in red over the pre-war map of Europe. Note: this map does not show the Irish Free State. France: gained Alsace-Lorraine as well as various African colonies from the German Empire, and Middle East territories from the Ottoman Empire. The African and Middle East gains were officially League of Nations Mandates. As early as 1923, Stanley Baldwin recognized a new strategic reality that faced Britain in a disarmament speech. Poison gas and the aerial bombing of civilians were new developments of the First World War. The British civilian population, for many centuries, had not had any serious reason to fear invasion. So the new threat of poison gas dropped from enemy bombers excited a grossly exaggerated view of the civilian deaths that would occur on the outbreak of any future war. Baldwin expressed this in his statement that "The bomber will always get through." The traditional British policy of a balance of power in Europe no longer safeguarded the British home population. Out of this fear came appeasement. It is notable that neither Baldwin nor Neville Chamberlain fought in the war, but the anti-appeasers Antony Eden, Harold Macmillan and Winston Churchill did. One gruesome reminder of the sacrifices of the generation was the fact that this was one of the first times in international conflict whereby more men died in battle than from disease, which was the main cause of deaths in most previous wars. The Russo-Japanese War was another conflict where battle deaths outnumbered disease deaths, but it was fought on a much smaller scale between just two nations. ^ Marks, Sally (1986). "1918 and After: The Postwar Era". In Martel, Gordon (ed.). The Origins of the Second World War Reconsidered. Boston: Allen & Unwin. p. 19. ISBN 0-04-940084-3. ^ Marsha L. Rozenblit (2004). Reconstructing a National Identity: The Jews of Habsburg Austria During World War I. Oxford UP. p. 163. ^ Kuhlman, Erika A., Of Little Comfort. 2012. pp. 120–121. ^ a b Cable, Amanda (2007-09-15). "Condemned to be virgins: The two million women robbed by the war". Daily Mail. Retrieved May 1, 2011. John Wheeler-Bennett The Wreck of Reparations, being the political background of the Lausanne Agreement, 1932 New York, H. Fertig, 1972. Post-war, in: 1914-1918-online. International Encyclopedia of the First World War. Kitchen, James E.: Colonial Empires after the War/Decolonization, in: 1914-1918-online. International Encyclopedia of the First World War. Bessel, Richard: Post-war Societies, in: 1914-1918-online. International Encyclopedia of the First World War. Rothermund, Dietmar: Post-war Economies, in: 1914-1918-online. International Encyclopedia of the First World War. Sharp, Alan: The Paris Peace Conference and its Consequences, in: 1914-1918-online. International Encyclopedia of the First World War.